You must be a member of the Helsinki Walking & Exploring Group to attend this activity. Would you like to join this group? 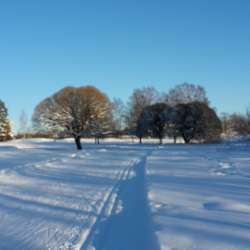 Let´s enjoy this lovely winter wonderland in combination with cross-country skiing. This is a great outdoor sport for sunny winter days - all while getting a good workout. You have the opportunity to exercise and recharge your batteries at the same time. Since the weather forecast promises still good snow conditions and acceptable temperature on Sunday, let´s take this chance to glide on fantastic snow through the wonderful nature. We will meet at Protected content , which in winter is the most popular cross-country center in Helsinki and is easy to reach by bus or car. You also have the possibility to rent ski equipment in Protected content . Please wear warm and proper clothes according to the weather, as we will spend some hours outdoors. There will be no entrance fee but the rent of the ski equipment is 24€ for 3hrs. For the rental of the equipment, you need an identity document. Please be on time, we will wait only around ten minutes before we start. If you are too late, it will be hard to find us in the field as Google tracking is not working properly without roads or paths. I will not be able to answer the phone us we are moving. We will be skiing in a circle around 10 km if the slopes are well prepared. The track is quite easy and we will adapt our speed to the group. But the trail, which we will take includes some small hills and some ups and downs. I would only recommend this trail for people who know how to stop and are already a bit safe on skis. There are some very easy trails (eg 1.5 km) around the starting point that are suitable for people who have never been cross-country skiing before. But you don´t have to do the whole circle, you can always turn back on the same trail to the café or choose smaller tracks. In the end, we will meet in the café. Please be aware of that I am not a teacher and that you will attend on your own responsibility. The place is easily reachable with public transport (Protected content ). There are also parking slots available.